EventStudyTools helps you perform event studies and news analytics analyses. Our website provides server-side research apps, reviews of methodological literature, access to event study experts, an R-package, and an API with which you can integrate our capabilities in your solutions. All services are free. Please consider a donation if you want to accelerate our mission to help you get published. Use our Award-winning research apps - for free! Review publications that cite us to get an inspiration on how to leverage our research apps. You can find citations in our research tracker and on Google Scholar. Join the other scholars who have performed 87093 free analyses and start with our research apps overview page. Watch the Chinese version of this introduction on youtube. How to conduct event studies with www.eventstudytools.com? To conduct an event study on www.eventstudytools.com, you simply need to parameterize your analysis and upload the respective financial data - which you can retrieve beforehand at one of the free financial data providers (e.g., Yahoo!Finance). Figure 1 illustrates this basic workflow. Please note that we offer three event study research apps: An abnormal return calculator (ARC) for return event studies, an abnormal volume calculator (AVC) for event studies that investigate abnormal trading volumes, and an abnormal volatility calculator (AVyC) if the trading volatility is to be investigated. Each abnormal effect calculator will give you the test statistics that you need for your publication. Which features does our advanced Abnormal Return Calculator (ARC) support? 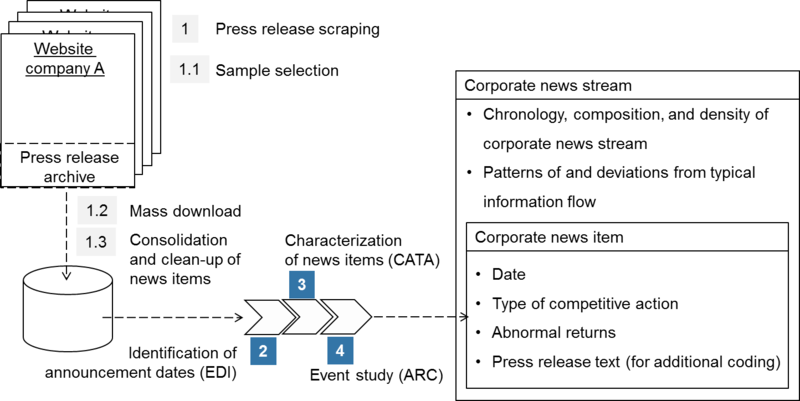 What is news analytics and how to apply it? News analytics describes the quantitative analysis of new streams aimed at turning news releases into quantitative metrics and time-series. There is a multitude of news analytics applications. First, the scientific analysis of qualitative dimensions of news that have previously been left unexplored. Second, the comparative analysis of event sequences. And finally, various practical applications, such as news-based trading strategies that trace actual firm behaviors. The figure beneath sketches the analytical framework that is implemented on EventStudyTools (see step-by-step tutorial) and has been used in various research publications. The impact of cash dividends on stock prices in the U.S.
Is there a black-box effect in listed private equity?